The Royal Basilica of Saint-Denis is both a cathedral and a historical heritage monument. The part that is specifically dedicated for prayer is accessible free of charge. A part of the royal necropolis, including the royal tombs, the crypt, the gothic chevet are accessible with an entrance paid ticket. It is ministered by the Centre des monuments nationaux. The Basilica is opened every day from monday to sunday. Closed on bank holidays (January 1st, May, 1st and December 25th) and during some of the religious services (do not forget to inquire). From April to September: 10 a.m. – 6:15 p.m. ; Sunday: noon – 6:15 p.m.
October to March: 10 a.m. – 5:15 p.m. ; Sunday: noon - 5:15 p.m. The ticket offices close 30 minutes before closing time. The Basilica is located in the heart of the commune of Saint-Denis, opposite the town hall. 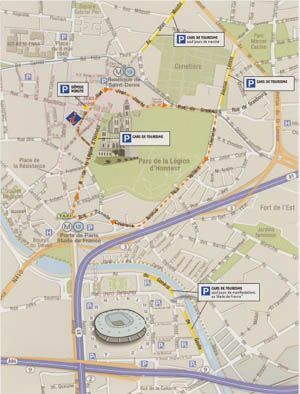 By car, 9 kilometres from the centre of Paris, Porte de la Chapelle, take the highway A1 exit Saint-Denis – town center. The center of Saint Denis is pedestrian, and there is no specific parking for the Basilica. For people with disabilities or handicap, it is possible to be dropped off in front of the Basilica (and park at the nearby parking) do not forget to put the handicap sign to indicate your disability. If you encounter difficulties to park, you will be able to park exceptionally inside the cathedral grounds. Access to the church and the royal necropolis is through the doorway to the right of the facade of the Basilica. To get to the royal necropolis, go through the door to the right of the nave where you will find the access ramp which leads directly to the ticket desk of the Basilica. The entrance door to the royal necropolis is just after the ticket office which includes two accessible spaces: the first space is the reception hall situated directly after the ticket office. Here you will find a permanent presentation of the monument, and a non-interactive 3D model of the abbey of Saint-Denis and the toilets. The second space is the entrance to the royal necropolis, situated on the left, on exiting the ticket office, at the top of nine steps. 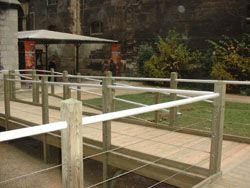 This space is not accessible to everybody, it is necessary to be accompanied by a customer service assistant in the monument who will help you to get to the royal necropolis by the access ramp located near the ticket office. He will then open the doors of the two transepts for you. You can then visit the south transept and the north transept between the royal tombs without difficulty but with some help for opening doors. Access to the chevet is only possible by a stairs of 16 steps, so this part will not be accessible. The assisting agent will accompany you and present this non accessible part to you. You can also visit the crypt of the Basilica, still accompanied by the agent, from the reception hall and by passing behind the chevet from outside. A pathway has been made accessible in part, to gain access to a stained-glass door that the assistant will open for you to take the lift which has been installed for disabled people to be able to visit the crypt stress free. To get to the royal necropolis, it is necessary to pass by the ticket desk. You must go to the right side of the monument, passing by the large entrance gate on the right and go direct to the ticket office. The entrance door to the royal necropolis is after the ticket office which includes two accessible spaces: the first space is the reception room situated directly after the ticket office. Here you will find a permanent presentation of the monument, and a non-interactive 3D model of the abbey of Saint-Denis and the toilets. The second space is the entrance to the royal necropolis, situated on the left, on exiting the ticket office, at the top of nine steps. Be careful, it is an old door with one step at the level of the gate. The South transept can be accessed easily. Movement around and between the royal tombs is fluid. From there, it is possible to go down to the la crypt (13 steps without a hand rail, it is steep), or you can opt to go up to the chevet (16 steps). At the chevet, you can walk around, without any major difficulties, between the tombs and the chapels and gain access to the north transept, going down the stairs (16 steps). In the crypt, you can move around normally, but take care of the slightly vaulted architecture and the columns; the lights are dim. Then, you can reach the north transept, via a steep stairs without a hand rail (13 steps). The north transept, which is accessible by the chevet or by the crypt, with no movement difficulties between and around the royal tombs. The exit door is via the entrance door near the south transept.